Russian President Vladimir Putin has taken to the ice in one of Sochi's Olympic sports arenas. The state leader played along the country's other top officials, sportsmen and businessmen in an NHL (Night Hockey League) match. The league has united Russia's amateur hockey clubs since 2011, when it was created under Putin's initiative. This year, the president decided to put his hockey gear on in Sochi, where amateur teams from across the country gathered to compete. 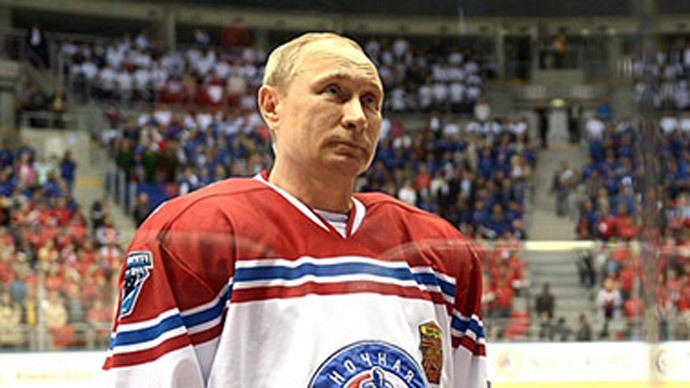 Putin opened the score in the game, and scored eight goals in total. The team of "Stars" that the president played in won the match: 18:6. Russia's Defense Minister Sergey Shoigu and Deputy Prime Minister Arkady Dvorkovich played too, while PM Dmitry Medvedev attended the event as a supporter. All players, including Putin, played under number 70 in the match, as this year's games were dedicated to the 70th anniversary of victory over the Nazis in World War Two.